I followed the major across the rough, pathless mountainside, often stumbling in the pitch blackness of the winter night. Eventually we stopped close to a Ghurka machine-gun post and waited. Using my headtorch was out of the question – it would alert the enemy to our position. I would have to start sketching in absolute darkness. Suddenly an all-mighty explosion erupted behind us, followed by more, causing the ground to vibrate: not good for the jolly old pencil. 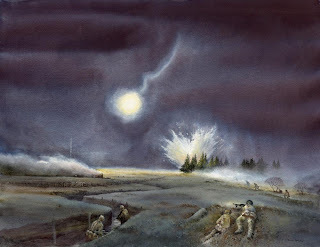 With more explosions the scene became lit up to a degree, the flashes illuminating conifers and the dying smoke of the previous explosions. Although still not able to use my torch, at least I could draw vaguely accurate impressions of the rather lively barrage with a water-soluble pencil. Still no sign of the attackers, so my drawing was devoid of figures. Then, with an almighty whoosh something nasty flew through the air, rose high and then illuminated the whole scene. Parachute flares began dropping as the enemy located our position and turned night into day. Machine-guns opened up on the flank and the Ghurkas began firing from their bunker as shadowy figures advanced on their lines. My pencil worked overtime, and now I could turn on my torch and illuminate my sketchbook. What a mess! Still, I managed to turn it into something reasonable. The atmosphere was incredible, with flares, bangs, automatic gunfire, figures hurtling by and smoke grenades going off. In less than half an hour it was all over. This all took place in the wilds of Mid-Wales at an infantry battle course. My objective was to produce a large watercolour to donate to the Help for Heroes charity which supports our wounded soldiers. The army were absolutely brilliant in helping me record this amazing spectacle. In all I did three sessions, one with live ammunition, complete with bullet-proof vest and armour-plated watercolour box. I can’t thank them enough.